In this picture, St. Matthew is NOT saying, Look, at what I have written, but look to Jesus who has written me into the Book of Life and learn from Christ Jesus day by day in all He said and did for the life of the world. This book is not written about me or about thee, but about the Christ for thee. O Son of God, our blessed Savior Jesus Christ, You called Matthew the tax collector to be an apostle and evangelist. Through his faithful and inspired witness, grant that we also may follow You, leaving behind all covetous desires and love of riches; for You live and reign with the Father and the Holy Spirit, one God, now and forever. The Institution of Holy Baptism and the most explicit revelation of the Holy Trinity (Matthew 28: 16-20). Tradition is uncertain where his final field of labor was and whether Matthew died naturally or a martyr’s death. In celebrating this festival, we therefore give thanks to God that He has mightily governed and protected His Holy church through this man who was called and sent by Christ to serve the sheep of His pastures with the Holy Gospel. 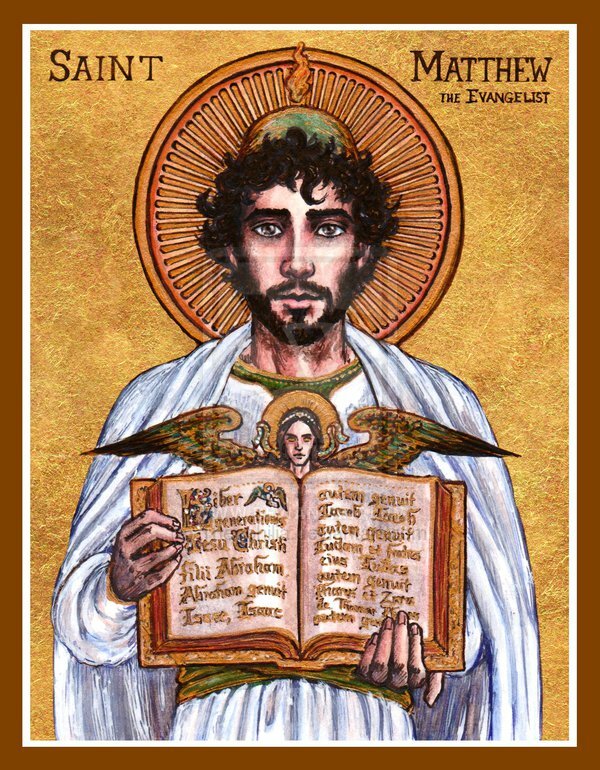 St. Matthew was an excellent, noble man–not only one of the 12 fountains of consolation, the apostle of Jesus Christ of paradise, a holy evangelist, whose words flowed from the great fountain in paradise, Jesus Christ. He not only praised the Lord in his heart and with his tongue but also put his quill to paper and wrote his account as a memorial…pay attention so that everything in and about you is directed toward the glory of the Lord, according to David’s example in Psalm 103:2. In the kingdom of God it is said…”Strive with every skill and word, to please your Savior, Christ the Lord.” None of the other evangelists described the history of the Lord Jesus to such an extent as Matthew. He also has many beautiful passages that cannot be found in the others. These three passages, which should cause the legs of all devout Christians to run quickly to the Church, were written only by Matthew. The context of the first passage is Peter’s Confession of Jesus as “Christ, the Son of the living God”. The second is our Lord’s preaching on the forgiveness of sins. The two passages are intimately related. At the heart of the Church is the confession of Faith: You are Christ, the Son of the living God”and it is upon this Word that Christ builds His Church. Flowing forth from Christ, the true Temple (John 2:21) are the rivers of God’s forgiveness (John 7:38) which forms the Church day by day in His Presence and by His grace. Faith and forgiveness are tied together in the unity of the Holy Spirit, the communion of saints in Christ’s Church. According to the grace of God given to me, like a skilled master builder I laid a foundation, and someone else is building upon it. Let each one take care how he builds upon it. 11 For no one can lay a foundation other than that which is laid, which is Jesus Christ. 12 Now if anyone builds on the foundation with gold, silver, precious stones, wood, hay, straw— 13 each one’s work will become manifest, for the Day will disclose it, because it will be revealed by fire, and the fire will test what sort of work each one has done. 14If the work that anyone has built on the foundation survives, he will receive a reward. 15If anyone’s work is burned up, he will suffer loss, though he himself will be saved, but only as through fire. The precious, noncombustible materials represent preaching, teaching, and pastoral care that rest upon the Gospel. The combustible items signify teaching and methods motivated by human “wisdom” (1:17-22; 2:1-5, 13; 3:19) and therefore at odds with God’s “wisdom” (1:24, 30; 2:6-7)—the doctrine of Christ. St. Matthew knew what the Lord said to Peter when Peter confessed Christ: Upon THIS ROCK, the confession of the identity of Jesus, I will build my Church. He heard Jesus say to go out and baptize all nations and teaching them. Well-meaning Christians have put forth so many new blue prints for a new and improved Church as reflected in church buildings from basilicas to auditoriums, from social justice centers to spiritual cafeterias to Christian ashrams. Worse than suspect church architecture is using sub-standard building materials which won’t build us up as living stones (1 Peter 2: 5). St. Matthew and all the inspired writers of the Scripture proclaim God’s Word of Law and Promise to us all fulfilled in the Word made flesh. One reason to use easier materials is that the “job gets done” and many a weekend carpenter has worked with wood and that’s fine for finishing a basement. Using the inferior “plans of mice and men”, of human wisdom and that work will not last when building the church, that is, you. Building the Church by using substandard materials and they tend to collapse and people die. Yet, it makes pastors feel useful and the job is done quickly and like the old saying, haste makes waste. “Gold, silver and precious stones” not only are more costly, but harder to work with than wood, hay and straw. Gold and silver take time to smelt and burn the dross. Pearls were not cultivated then, but one had to dive into the depths of the ocean to find them. In fact finding one, one sells all he has to buy it. This triumvirate lasts as this is the Word of the Lord and it endures forever. Your path of suff’ring shared. May rise and follow You. And praise to God alone.